River Island is one of those stores that you forgets sells Children's Clothing. It is uber fashionable but also very popular. Their sales are usually pretty good, and their current one is no exception. Items start from just £1 so you can really kit the kids out for less. Be quick though, as stock is selling fast, and no wonder with these prices. Gilets, bodywarmers,waistcoats and sleeveless jackets seem to be in at the moment. Save yourself some money and check out these ones in the River Island sale: Girls' Pink Draped Sleeveless Jacket* was £22 now only £12 and Girls' Faux Suede Fringed Sleeveless Gilet* was £30 now only £15. Not sure how long this would stay white for but it's a bargain... Boys' Superior Sweatshirt* was £14 now only £7. 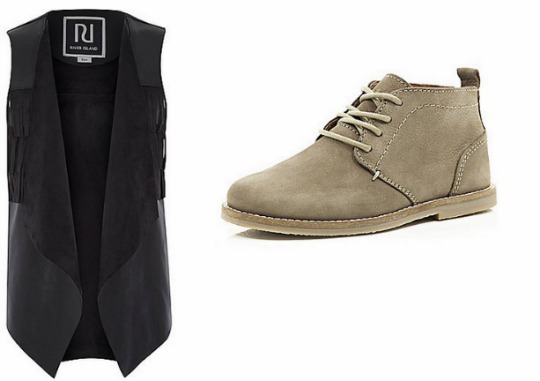 We are also loving these Boys' Leather Desert Boots*for just £16, reduced from £32. You can Click and Collect your Sale bargains for FREE from a River Island store near you or pay £3.95 to have them delivered to your front door.